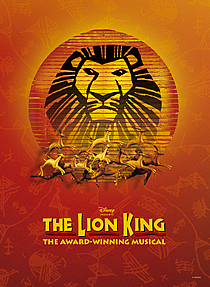 With a cast of over 40 actors, singers and dancers, the story of The Lion King is miraculously brought to life using masks, puppets and striking costumes to tell the story of young Simba's epic adventures as he struggles to accept the responsibilities of adulthood and becoming king. The stunning simplicity of The Lion King is the work of a team of designers who draw on diverse cultural influences to recreate the rich colours and vast expanses of the African savannah in this daring and inspiring reinvention of one of the most successful animated films of all time. The Lion King is not recommended for children under 5 and no child under the age of 3 will be admitted.